I get a lot of people who ask me about my career and so I figured this was the perfect place to answer the million-dollar question: “Do you like being a flight attendant?”. When most people think of flight attendants, they think back to the glitz and the glamour of the 1960’s “stewardess” as it was then referred to. The young, single twenty-somethings who flew for PanAM on planes filled with only those who could afford the luxury of air travel. The first thing I will tell you is that the days of the glitz and glamour are way behind us. My job is in no way shape or form glamorous. It is hard work. You work weekends, holidays, are away from home for days at a time, make a very modest salary in the beginning of your career, and have to deal with some very unruly passengers from time to time. But, with all of that being said, I am head over heels in love with what I do! Being a flight attendant is all about seniority, which means the more time you put in, the higher you ‘climb up the ladder’ and the better the job gets. I can’t tell you how many people I’ve flown with that ‘only planned on flying for a couple years’ until they figured out what they really wanted to do. And, 30 years later, they are still flying. The reason for this is because the job gets better with time. Is it extremely hard in the beginning? Yes. But the first couple of years is the hardest it’s ever going to be. Once you put in a little bit of time and increase in seniority, the job keeps getting better. Not only do you continue to get yearly pay increases, but your schedule also starts to improve, which brings me to the first reason of why I love my job: the flexibility. One of the greatest parts of my job is that I can work however much I want and chose what days I want to work(with some exceptions, of course). The second reason I love my job is the benefits. It is such a great way to travel the world if, like me, you aren’t made of money. The third reason I love my job is that it’s a new adventure and atmosphere with every trip I work. I get work with different flight attendants and pilots often. It is such a fun surprise to walk on the flight to find out I am working with one of my favorite coworkers that is based in another state! Basically it is as far from an office job as it could possibly be. Not only am I traveling to different places every week, but I am able to meet so many gracious, kind, unique passengers along the way. Each one of these points that I just listed all go into making my job so wonderful and unique. But, the reason I love my job the most is that I get to work with the most amazing group of people that I consider my second family: my fellow flight attendants, pilots, agents and all employees at Alaska Airlines. I honestly feel so privileged to work for such an amazing company. We all consider each other family and that makes for a very uplifting and encouraging work environment. When you feel that kind of love and support from your fellow employees, you can’t help but want to pass it on to the passengers. Being a flight attendant requires strong interpersonal, communication, and physical skills, as well as a whole lot of patience. However, I believe the most important quality that is required for the job is something that cannot be taught: a genuine kindness that comes from the heart. Mollie, that was just best summary of why we do what we do. I couldn’t have explained it any better. Loving what you do & the people you are surrounded by make it all worth while. This goes for all aspects of life! See you on the jumpseat one day soon! That was beautiful Mollie, just like you! What a great post! When someone is truly passionate about what they do, it shows and it is a beautiful thing. Thank you so much for sharing this with us. Nice post! Interesting to read about life experiences and choices that are made. To read about how a positive attitude is infectious is inspiring and a good reminder. Both you and Mollie are beautiful women inside and out. I’m a flight attendant too (different airline) and summer flying has been sucking my sanity away! It’s always refreshing to read what people love about the job because it reminds me why I started. 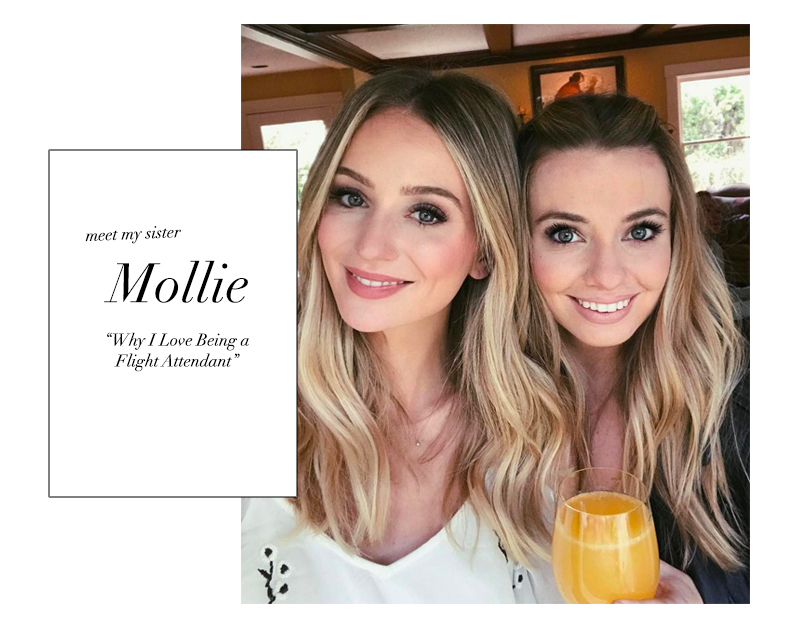 You ladies rule, I’m in love with this post Mollie and your blog Lauren! I am new to Alaska Airlines Inflight, formally at Horizon Airlines Inflight, our sister company. Thank you for saying such kind words about a company that every day I leave my “office” I never feel like I left a job I couldn’t see myself 30 years down the road still doing. Every day is a new adventure and I’m glad after all this time with you being with the company you still feel the same way! ✈️💙 I’m so lucky to have found a home away from home!